The detection, flux determination and spectral modeling of Fermi LAT sources is accomplished by a maximum likelihood optimization technique, as described in the Cicerone (see also e.g. Abdo, A. A. et al. 2009, ApJS, 183, 46). To illustrate how to use the Likelihood software, this narrative gives a step-by-step description for performing an unbinned likelihood analysis. Unbinned likelihood analysis is the preferred method for time series analysis of the LAT data, where the number of events in each time bin is expected to be small. However, for large time bins, analysis which includes bright background sources (such as the Galactic plane), and long time-baseline spectral and spatial analyses, a binned analysis is recommended. To perform a binned likelihood analysis see the Binned Likelihood tutorial. You will need an event data file, a spacecraft data file (also referred to as the `pointing and livetime history' file), and the current background models (available for download). You may choose to select your own data files, or to use the files provided within this tutorial. Custom data sets may be retrieved from the LAT Data Server. Download the latest diffuse models: The recommended models are gll_iem_v07.fits (a very large file) and iso_P8R3_SOURCE_V2_v1.txt. All of the background models along with a description of the models are available here. Compute the diffuse responses: Each event must have a separate response precomputed for each diffuse component in the source model. Make an Exposure Map: This is needed in order to analyze diffuse sources, and derive absolute fluxes. Make Test-Statistic Maps: These are used for point source localization and for finding weaker sources after the stronger sources have been modeled. For this case the original extraction of data from the first six months of the mission was done as described in the Extract LAT Data tutorial. If you need to combine multiple events files for your analysis, you must first generate a text file listing the events files to be included. This text file (events.txt) will be used in place of the input fits filename when running gtselect. The syntax requires that you use an @ before the filename to indicate that this is a text file input rather than a fits file. For simplicity, we rename the spacecraft file (the file ending in .SC00) to spacecraft.fits. When analyzing a point source, it is recommended that you include events with high probability of being photons. To do this, you should use gtselect to cut on the event class, keeping only the SOURCE class events (event class 128) (or as recommended in the Cicerone). In addition, the full set of events have been divided into event types, which allow us to select events based on the conversion type, the quality of the track reconstruction, or the quality of the energy measurement. For standard selections, including all the event types for a given class, use evtype=3 ("INDEF" is the default in gtselect). In the last step we also selected the energy range and the maximum zenith angle value (90 degrees). The Earth's limb is a strong source of background gamma rays. We filter them out with a zenith-angle cut. The value of 90 degrees is the one recommended by the LAT instrument team for analysis above 100 MeV. The filtered data are provided here. The data with all the cuts described above is provided in this link. A more detailed discussion of data selection can be found in the Data Preparation analysis thread. Here you can see the event class selection, the location and radius of the data selection, the event type selection, as well as the energy range in MeV and the zenith angle cut. 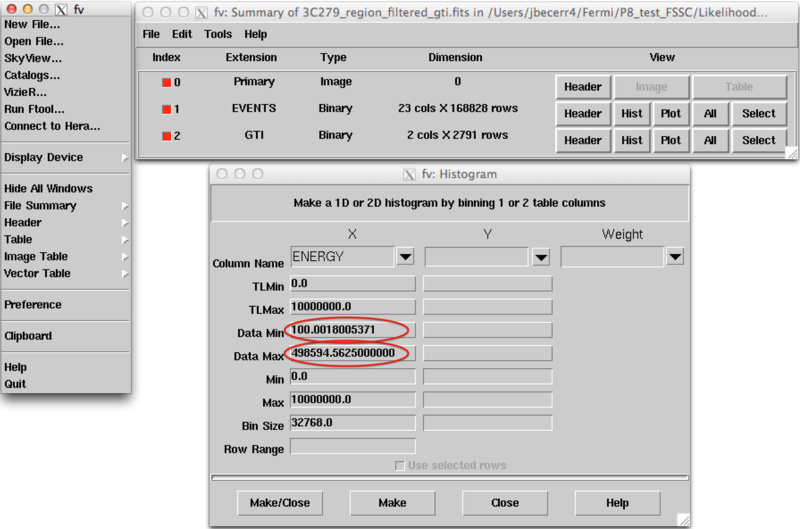 The time cuts to be used in the exposure calculation are defined by the GTI table. Click on the "Hist" button for the EVENTS extension. Then select for the X axis ENERGY. The minimum and maximum energies are given by Data Min and Data Max. If Data Max is of the order of the maximum energy we used in our data selection we can proceed. However, if Data Max is much smaller than the energy used in gtselect then we need to come back to gtselect and make a tighter energy cut to make sure we will have enough statistics. NOTE: Here gtbin shows a warning due to the fact we are not using the spacecraft file. This is not a concern. We are now ready to create an exposure map. The type of exposure map used by Likelihood differs significantly from the usual notion of exposure maps, which are essentially integrals of effective area over time. The exposure calculation that Likelihood uses consists of an integral of the total response over the entire ROI. See more information in the Cicerone. Since the exposure calculation involves an integral over the ROI, separate exposure maps must be made for every distinct set of DSS cuts. This is important if, for example, one wants to subdivide an observation to look for secular flux variations from a particular source or sources. To view the DSS keywords in a given extension of a data file, use the gtvcut tool and review the data cuts for the EVENTS extension. There are two tools needed for generating exposure maps. The first is gtltcube. 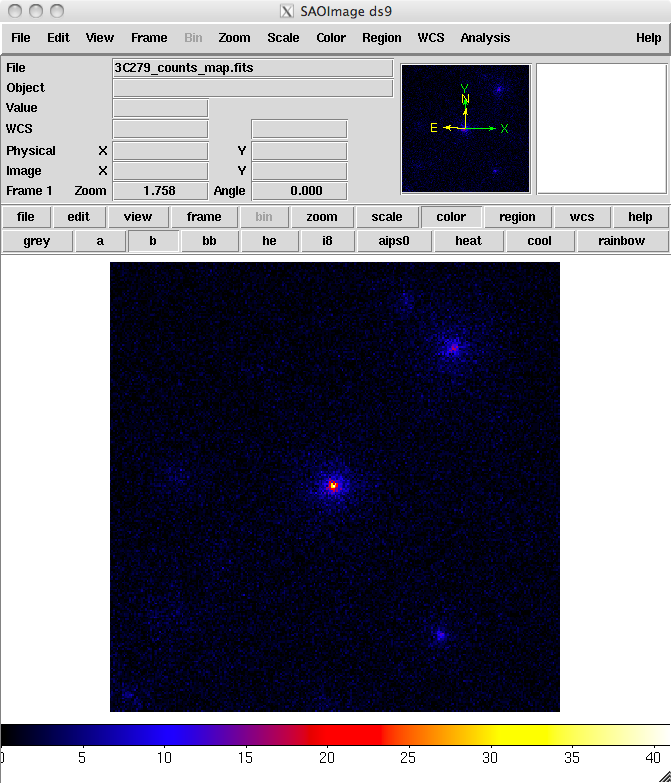 This tool creates a livetimecube, which is a HealPix table, covering the full sky, of the integrated livetime as a function of inclination with respect to the LAT z-axis. For more information about the livetime cubes see the documentation in the Cicerone. NOTE: Values such as 0.1 for `Step size in cos(theta)' are known to give unexpected results. Use '0.09' instead. The livetime cube generated for this analysis can be found here. Since gtltcube produces a FITS file covering the entire sky, the output of this tool could be used for generating exposure maps for ROIs in other parts of the sky that have the same time interval selections. But use caution! The livetime cube MUST be regenerated if you change any part of the time interval selection. This can occur by changing the start or stop time of the events, or simply by changing the energy selection or zenith angle cut (as these produce a different set of GTIs from gtmktime). See e.g. Data Preparation in the Cicerone or the Data Preparation analysis thread. Although the gtexpmap application (see below) can generate exposure maps for Likelihood without a livetime file, using one affords a substantial time savings. b. Generate an exposure map. 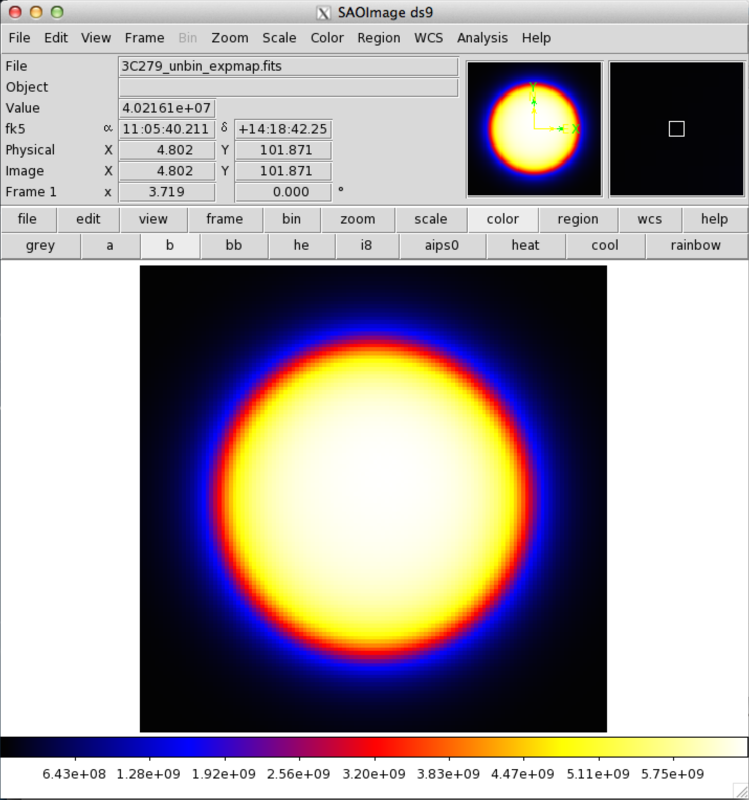 The tool gtexpmap creates an exposure map based on the event selection used on the input photon file and the livetime cube. The exposure map must be recalculated if the ROI, zenith, energy selection or the time interval selection of the events is changed. For more information about the exposure maps see the documentation in the Cicerone. to be used for *unbinned* likelihood analysis only. Do not use them for binned analyses. Note: If trying to use CALDB in the example above does not work, just put the IRF name in explicitly. The appropriate IRF for this data set is P8R3_SOURCE_V2. Note that we have chosen a 30 degree radius 'source region', while the acceptance cone radius specified for gtselect was 20 degrees. See the discussion of region selection in the Cicerone. This is necessary to ensure that events from sources outside the ROI are accounted for owing to the size of the instrument point-spread function (PSF). 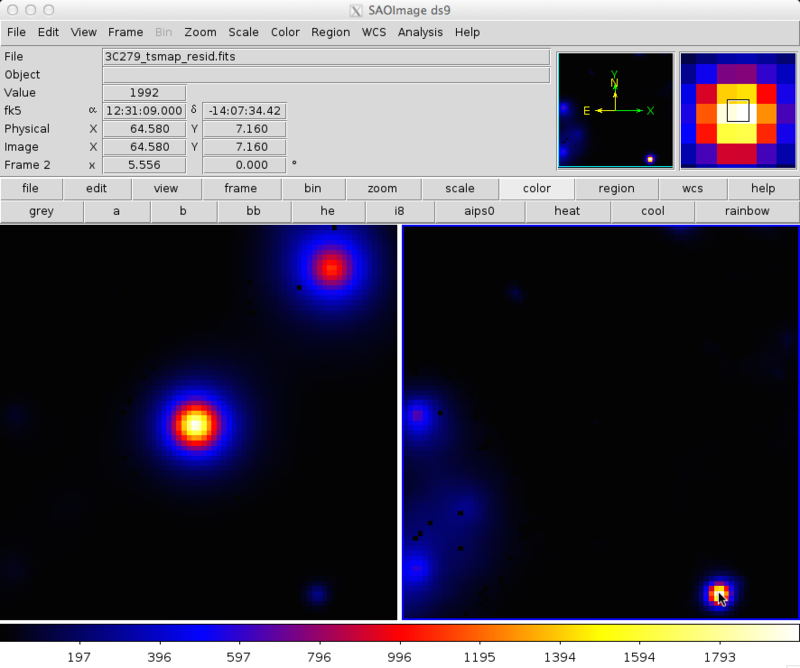 Half-degree pixels are a nominal choice; smaller pixels should result in a more accurate evaluation of the diffuse source fluxes but will also make the exposure map calculation itself lengthier. The number of energies specifies the number of logarithmically spaced intervals bounded by the energy range given in the DSS keywords. A general recommendation is 10 bins per decade. This is sufficient to accommodate the change in effective area with energy near 100 MeV. REMEMBER: The exposure needs to be recalculated if the ROI, zenith angle, time, event class, or energy selections applied to the data are changed. 5. Create a source model XML file. The gtlike tool reads the source model from an XML file. The model file contains your best guess at the locations and spectral forms for the sources in your data. A source model can be created using the model editor tool, by using the user contributed tool make4FGLxml.py, or by editing the file directly within a text editor. If your region includes any extended sources, you will need to add one or more extended sources to your XML model. Download the extended source templates from the LAT Catalog page (look for "Extended Source template archive"). Extract the archive in the directory of your choice and note the path to the template files, which have names like 'W44.fits' and 'VelaX.fits'. You will need to modify your XML model so that the path to the template file is correct. In addition, you will need to add the modifier map_based_integral='true' to the <spatialModel> atttribute. This modifier tells gtlike to use the proper integration method when evaluating the extended source. 6. Compute the diffuse source responses. The diffuse source responses are computed by the gtdiffrsp tool. The source model XML file must contain all of the diffuse sources to be fit. gtdiffrsp will add one column to the event data file for each diffuse source. The diffuse response depends on the instrument response function (IRF), which must be in agreement with the selection of events, i.e. the event class and event type we are using in our analysis. In this case we are using the standard SOURCE class (evclass=128) and event type 3 (FRONT+BACK), so we should use the IRF P8R3_SOURCE_V2 (which is the most commonly used in standard analysis). Alternatively, you can just use CALDB for the IRF and the appropriate IRF will be automatically applied according to the previous event selection you performed during the previous steps of the analysis. If the diffuse responses are not precomputed using gtdiffrsp, then the gtlike tool will compute them at runtime (during the next step). However, as this step is very computationally intensive (often taking ~hours to complete), and it is very likely you will need to run gtlike more than once, it is probably wise to precompute these quantities. The first part tells you the IRF name and, after the double underscore, the name of the diffuse component associated with the response. If you are using a different IRF or diffuse model, you MUST compute a custom diffuse response prior to continuing the analysis. Now we are ready to perform a likelihood analysis. You can get the file including the diffuse responses here. We are now ready to run the gtlike application. You may need the results of the likelihood fit to be output in XML model form (e.g. to use in generating a test statistic map). To obtain an XML model output in addition to the standard results files, use the sfile parameter on the command line (as shown below) to designate the output XML model filename. Most of the entries prompted for are fairly obvious. In addition to the various XML and FITS files, the user is prompted for a choice of IRFs, the type of statistic to use, the optimizer, and some output file names. UNBINNED This is a standard unbinned analysis, described in this tutorial, to be used for short timescale or low source count data. If this option is chosen then parameters for the spacecraft file, event file, and exposure file must be given. The application proceeds by reading in the spacecraft and event data, and if necessary, computing event responses for each diffuse source. This means that we are trying to do our analysis beyond the maximum energy covered by the data sample. We should have checked that it was not the case during the data selection (as recommended in step 1). 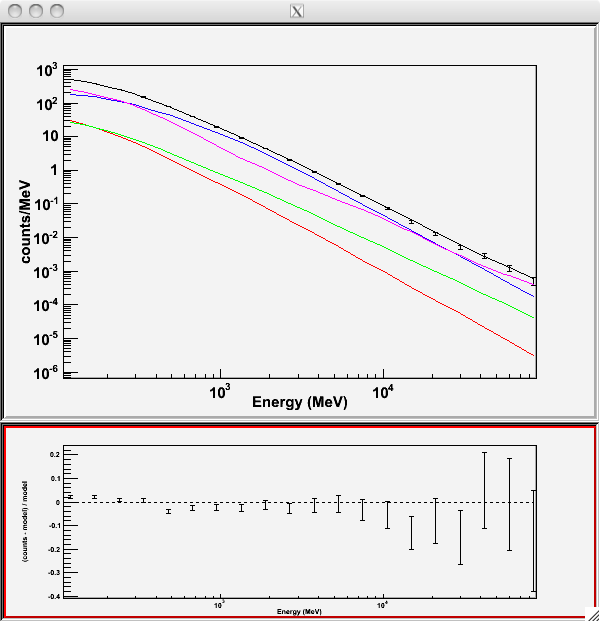 To solve this issue we need to apply a harder cut in our event selection, setting the maximum energy within the energy range of available photons in your data sample. Fortunately, this new event selection will not affect the time calculation (previous steps do not need to be repeated). Since we selected `plot=yes' in the command line, a plot of the fitted data appears. In our case the 3C273 is the one in red, 3C279 is the one in green, the extragalactic background is blue and the galactic background is magenta. If you have more sources the colors are reused in the same order. To assess the quality of the fit, look first for the words at the top of the output `<Optimizer> did successfully converge.'. Successful convergence is a minimum requirement for a good fit. Next, look at the energy ranges that are generating warnings of bad fits. If any of these ranges affect your source of interest, you may need to revise the source model and refit. You can also look at the residuals on the plot (bottom panel). If the residuals indicate a poor fit overall, you should consider changing your model file, perhaps by using a different source model definition and/or adding new sources in the ROI, and then refit the data. Here, hitting "return" will instruct the application to fit again. We are happy with the result, so we type `n' and end the fit. When it completes, gtlike generates a standard output XML file with the results of the fit. If you re-run the tool in the same directory, these files will be overwritten by default. Use the clobber=no option on the command line to keep from overwriting the output files. In this example, we used the "sfile" parameter to request that the model results be written to an output XML file, 3C279output_model.xml. This file contains the source model results that were written to results.dat at the completion of the fit. NOTE: If you have specified an output XML model file and you wish to modify your model while waiting at the `Refit? [y]' prompt, you will need to copy the results of the output model file to your input model before making those modifications. Errors reported with each value in the results.dat file are 1Ïƒ estimates (based on the inverse-Hessian at the optimum of the log-likelihood surface). If you are scripting and wish to generate multiple output files without overwriting, the 'results' and `specfile' parameters allow you to specify output filenames for the results.dat and counts_spectra.fits files respectively. If you do not specify a source model output file with the `sfile' parameter, then the input model file will be overwritten with the latest fit. This is convenient as it allows the user to edit that file while the application is waiting at the `Refit? [y]' prompt so that parameters can be adjusted and set free or fixed. This would be similar to the use of the `newpar', `freeze', and `thaw' commands in XSPEC. Ultimately, one would like to find sources near the detection limit of the instrument. To do this, you model the strongest, most obvious sources (with some theoretical prejudice as to the true source positions, e.g., assuming that most variable high Galactic latitude sources are blazars which can be localized by radio, optical, or X-ray observations), and then create `Test-statistic maps' to search for unmodeled point sources. These TS maps are created by moving a putative point source through a grid of locations on the sky and maximizing -log(likelihood) at each grid point, with the other, stronger, and presumably well-identified sources included in each fit. New, fainter sources are then identified at local maxima of the TS map. The gttsmap tool can be run with or without an input source model. However, for a useful visualization of the results of the fit, it is recommended you use the output model file from gtlike. The file must be edited so all parameters are fixed (by setting the `free' attribute to 0 for each parameter). Otherwise gttsmap will attempt a refit of the entire model at every point on the grid. To see the field with the fitted sources removed (i.e. a residuals map), fix all point source parameters before running the TS map. To see the field with the fitted sources included, edit the model to remove all but the diffuse components. In both cases, leave the Galactic diffuse prefactor (called `Value' in the model file) and the isotropic diffuse normalization parameters free during the fit. Running gttsmap is extremely time-consuming, as the tool is performing a likelihood fit for all events at every pixel position. One way to reduce the time required for this step is to use very coarse binning and/or a very small region. In the following example, we run a TS map for the central 20x20 degree region of our data file, with .25 degree bins. This results in 6400 maximum likelihood calculations. The run time for each of the maps discussed below was approximately one week. The output from the fit is below. Because generating TS maps takes a long time, you may wish to download the residuals and source files attached here. In the left panel, only diffuse sources were included in the analysis. The right panel shows the same field, but with the point sources (3C 279 and 3C 273) included in the model, and thus not included in the output image. This gives a pseudo-residuals map. The bright source clearly seen in the lower part of this image is a recently identified millisecond pulsar. The location of the cursor in the image indicates the TS value at each position. NOTE: There may be a number of black pixels in these images where the likelihood fit did not converge. You should try adjusting the tolerance or using a different minimizer to keep this from happening. If you encounter this error, then Binned Likelihood analysis is for you!